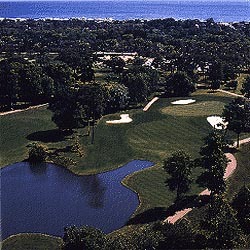 Southern hospitality is alive and well at one of the oldest and best conditioned courses on the Grand Strand. Nestled between the Atlantic and the Intracoastal Waterway, Beachwood Golf Club boasts a pleasant and courteous staff and excellent year-round course conditions. Beachwood features it's signature hole #18, a long par 3 over water bringing an exciting finish to a fun and relaxing round of play. Tournament credits at Beachwood include the 1989 Carolina Open, the 1992 Golf Writers Of America, and annually hosts the Carolina PGA Seniors Championship, and the DUPONT WORLD AMATEUR CHAMPIONSHIP.